It is with a very heavy heart that I write this blog post. 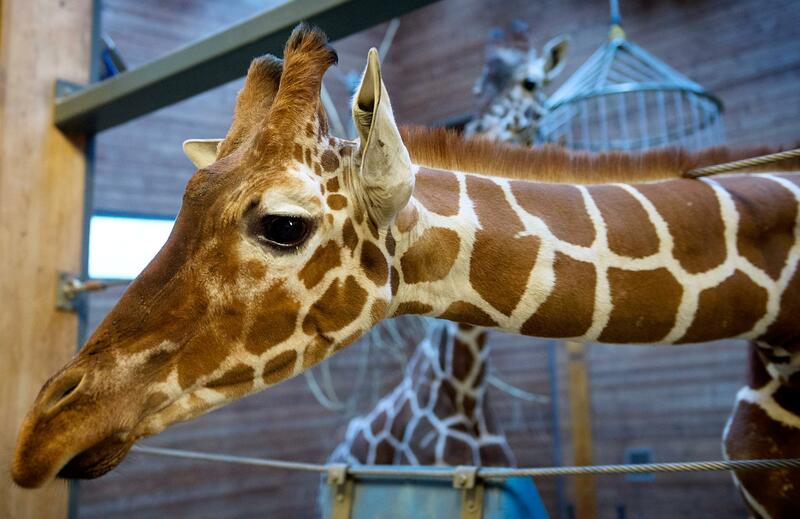 By now most of you have heard of Marius, the young giraffe that was needlessly “euthanized” at the Copenhagen Zoo in Demark. I say “euthanized” in quotations because their idea of euthanasia is not what I think of as euthanasia, where the animal is given a cocktail of sedative and sodium pentobarbital so that it passes peacefully. Of that euthanasia, sadly, I am all too familiar in having had to say goodbye to my own precious dogs when it came their time. But the “euthanasia” at the Copenhagen Zoo was barbaric: Marius was lured with his favorite treat – rye bread – and then just as he was enjoying the bread, the “vet” SHOT HIM IN THE HEAD! And this was all carried out in public, with a viewing audience. But it gets worse. It’s hard to think that it could get any worse but what happened next is off the charts atrocious. After Marius lie there dead, the zookeepers performed a necropsy and then proceeded to cut him up into pieces and fed him to the lions. Mind you, all of this taking place in front of a cast of onlookers, including children. Children witnessing this horrific act. Oh, how they will have to endure reliving this ghastly incident over and over in their young minds. I’m sure the adults will have nightmares as well. I am so appalled and so angered. What has my blood boiling all the more is listening to Bengt Holst, director of research and conservation at Copenhagen Zoo, explain the reason that Marius was killed. 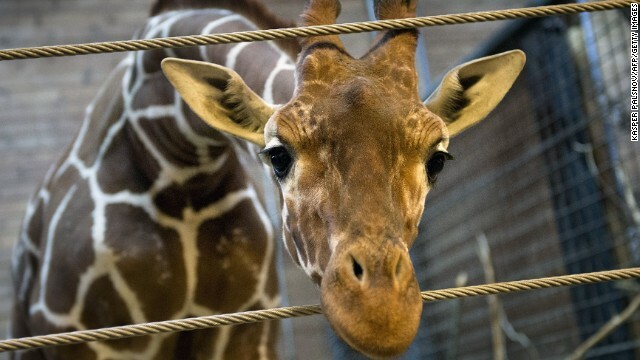 According to Holst in a CNN interview, Marius was “a surplus to the population and as being part of a breeding program you always have to make the population as sound as possible.” He went on to explain that once bred, they evaluate the genes of the giraffes and match that to the population. In other words, the zoo didn’t have room to accommodate Marius’ genetic makeup. And to sterilize him would still present the problem of a surplus in the zoo’s giraffe population. They didn’t have adequate space to stave off inbreeding. WHAT?? Oh, let me understand this: the Copenhagen Zoo’s idea of a high standard of welfare is to shoot Marius in the head and systematically butcher him in front of zoo attendees. THAT’S high operating standards? Jesus. As far as the method of destruction, why not a humane method of euthanasia? Because, Holst rationalizes, the lethal injection would have contaminated a large amount of “perfectly good meat” and that was not acceptable. And then at some point this man goes on to say that death is a natural part of life. BUT MURDER IS NOT NATURAL!! What’s most disturbing to me is this man’s utter lack of empathy and compassion. He claims his zoo is an ethical organization, doing what’s best for the animals, and that the animals have a good life while they’re alive. I guess that means a good life until someone decides to shoot them in the head! Oh my God, I’m just so angry. Because it wasn’t just this man who made the decision. The zoo officials were all onboard with the decision, a decision which was made after numerous petitions were put forth in an effort to save Marius’ life. I’m against zoos in the first place, but the fact remains they do exist. And if we are forced to live in a world where animals are kept in captivity for purposes of profit and entertainment, then there has to be a way to keep the animals safe. But that’s simply impossible. Even though there are governing bodies and oversight committees that are supposed to do just that. For example, state-run Racing Commissions are supposed to police the race tracks and the trainers to ensure that the race horses and greyhounds are being treated humanely, yet we hear horror stories all too often about the outright abuse and neglect that goes on in the industry. We hear the stories of zookeepers who beat the animals with sticks. There was a case in my own community in which efforts by animal rights advocates to block the opening of an aquarium were unsuccessful. The alarm bells were sounding when it was discovered that the owners of this new aquarium are currently facing charges in other states where they have aquariums; charges of illegally obtaining wildlife, improper housing, animal neglect and cruelty, along with conspiracy and obstruction of justice. The result was an oversight committee set in place to ensure the proper handling, housing and treatment of animals. Now I witnessed firsthand improper housing on a recent visit to the aquarium when a crab killed a starfish right in front of the crowd. We yelled for help but by the time the aquarium personnel got there, it was too late and the starfish was dead. Now how could this even happen, when all of the aquarium employees are supposed to be degreed marine biologists? Wouldn’t degreed marine biologists know that crabs and starfish shouldn’t be housed together? At the request of PETA, I went back a few days later to see if they had made changes to the housing situation and they had; crabs were no longer being kept in the same tanks as the starfish. But I’ve digressed a bit here and that’s a story for another time. My point being that even with supposed checks and balances in place to ensure the safety and humane treatment of animals in captivity, abuse, neglect and ignorance still prevail. 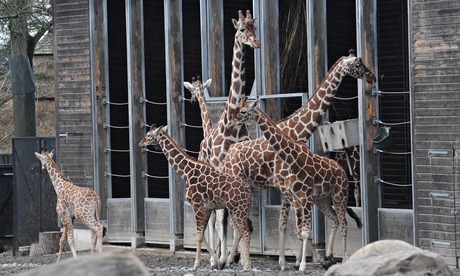 My heart breaks for Marius…and for all the animals kept against their will in zoos around the world. The outrage over Marius’ senseless killing and the media attention it is now getting is bringing an awareness to the forefront. But will it be enough? Or will it just be another headline that vanishes when the next big story hits? We must do all we can to bring forth the understanding that all animals are sentient beings, and that they all have souls and are deserving of our reverence, compassion and love. And it must be taught that as sentient beings, animals experience feelings and emotions. No doubt the other giraffes with which Marius shared time and space are grieving this unconscionable loss. With regard to Marius, I know I’m supposed to be more enlightened at this stage, and sometimes I am. However, this shocking act of a pointless killing has left me incensed. And seeing video (taken from the Copenhagen Zoo’s surveillance cameras) of Marius in his final moments, this magnificent and gentle animal who had his whole life ahead of him, has left me with a heavy and vengeful heart. The only solace comes from knowing that Marius is in a much better place now, a place where there is no evil, no cruelty, only love. You are one with God now, sweet Marius. May your death be not in vain. This entry was posted in Posts and tagged Bengt Holst, Copenhagen Zoo, Denmark, euthanasia, giraffe, Marius, Marius the giraffe, senseless killing by greyzoned/angelsbark. Bookmark the permalink. Thats sooo sad….. wow. There are much better and softer ways to go about this.. the vet ought to be ashamed.. it would be nice to see this kind of activity on a “banned” list or something… completely unacceptable. oh yea, agreed… i did watch it.. marius looked at peace .. and gets treated that way.. damn shallow.. you’re probably most certainly right about the money aspect… i recently stumbled across this video and he makes really good points along this kind of topic..
And hey, thanks for the retweet! I just saw that. I appreciate that. You rock! Michele, I hadn’t heard about Marius until I read your blog….oh, I am so upset and angry! There’s something seriously wrong with this man who could stand by and condone/arrange such a barbaric ending to this beautiful, innocent creature. Poor Marius. I certainly hope those responsible are brought to justice. I don’t think I’ll ever get over this Shari. It sickens me and breaks my heart at the same time. So outraged I want to scream! Thanks for stopping by my blog. Not only was this whole affair horrifying, I was completely shocked by the fact that people willing stood around to watch much of it. Why would people want to see that? I feel that if they wanted to make this “natural” they should have just forced Marius into the lion enclosure. Would people have stayed to watch that? Fortunately this case got huge media attention, and the best we can hope for is that people are so outraged that this will not happen again. The Copenhagen Zoo just killed four lions, shortly after killing Marius. The zoo stated that it was not afraid of the public outcry after the murder of Marius, and went ahead with the killing of the four lions, stating that two were “too old” and two were “too young” (being lion cubs). This is blatant murder, not conservation. The zoo is out for money, the animals be damned! And I’m so angry about it Bev! I’m actually planning on writing about it at the end of the month in my A-Z challenge post, Z is for Zoo. My blood just boiled when I heard about those four lions. Appalling!! Evil. And it breaks my heart. Absolutely shocking! I read about that. It’s ridiculous considering the animal exchange and adoption programs run by most zoos. Lions are a toughie though, because a new alpha will kill other males and cubs. Still, you don’t hear about it happening anywhere else, so everyone else has managed to sort it out. I’m sure it’s just a matter of keeping them separated. i cant understand how people could’ve stood around and watched this either!! What does that say about them??? Still sad to think about Marius. I had wrote to Bengt Holst, Danish Prime Minister, Leslie Dickie whoever was responsible for that killing. They have no ears no eyes. They don’t hear us. They don’t listen to us. They are too shallow. And they have no heart. Thank you for taking the steps you did! A lot of people don’t take the time to write letters anymore. It DOES make a difference! Thanks for caring. And thanks for stopping by!